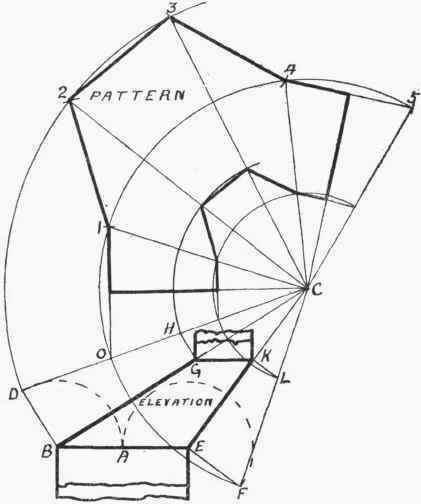 In a similar manner to the previous case, when two square pipes of unequal sizes require connecting, the intermediate pipe will come out as a frustum of an oblique square pyramid, as shown in Fig. 317. For the pattern B D will be drawn perpendicular to CB and equal in length to B A; D then being joined to C and H G drawn square to B G. In the same way points F and L can be determined. Now using C as centre, arcs are swept around from points D, F, H, and L. Then commencing, say, at 0 the distances 0 1, 1 2, etc., each equal to B E, are marked off. The remaining part of the work should require no further description.